People make a difference for birds -- and create something for people, too! For decades, Cove Island in Stamford, Connecticut, on the shore of Long Island Sound, was a dumping ground for construction debris. 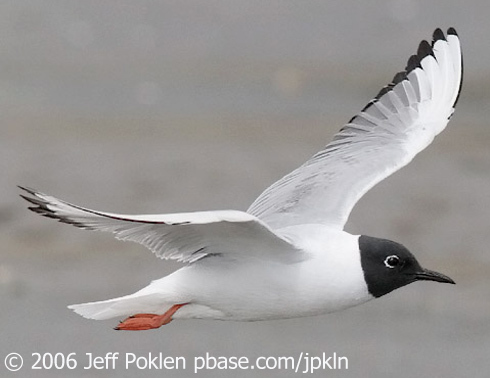 Today, it's Cove Island Wildlife Sanctuary, an oasis for birds (like this Bonaparte's Gull) and other wildlife, as well as for humans. Thanks go to Mike Moccio and Patrick Dugan, committed individuals who made a difference. Visit your local Audubon chapter or other environmental advocacy organization, and find out what you can do. Good luck - and thanks! For decades, this is what you would have heard at Cove Island in Stamford, Connecticut, on the shore of Long Island Sound. Originally a salt marsh, Cove Island was diked and drained in the 1950s. It became a dumping ground for stumps and construction debris. Today, it’s a sanctuary for birds and other wildlife, a natural oasis for humans in a region where millions of people live. How did this transformation occur? Mike Moccio and Patrick Dugan, two avid birders and naturalists living in Stamford, had a vision for a revitalized Cove Island. They gained the support of city staff, the mayor, and their state representative. Chapters of Audubon supported their cause. They worked for nine years. To date, 290 species of birds have been observed at Cove Island Wildlife Sanctuary. The conclusion is inescapable: Committed individuals make the difference. Don’t give up. Make phone calls, print flyers, start a web site. Find out the right people to talk to in government. Don’t be aggressive or overstate your case; be honest. Back up your statements with facts, figures, and photographs. Treat your mission as an educational process and you will win over most reasonable people. Good Luck! Bird audio provided by The Macaulay Library at the Cornell Lab of Ornithology, Ithaca, New York. Prothonotary Warbler song recorded by W.L. Hershberger. Bonaparte’s Gull call recorded by W.W.H. Gunn. Vesper Sparrow song recorded and provided by Martyn Stewart, naturesound.org.